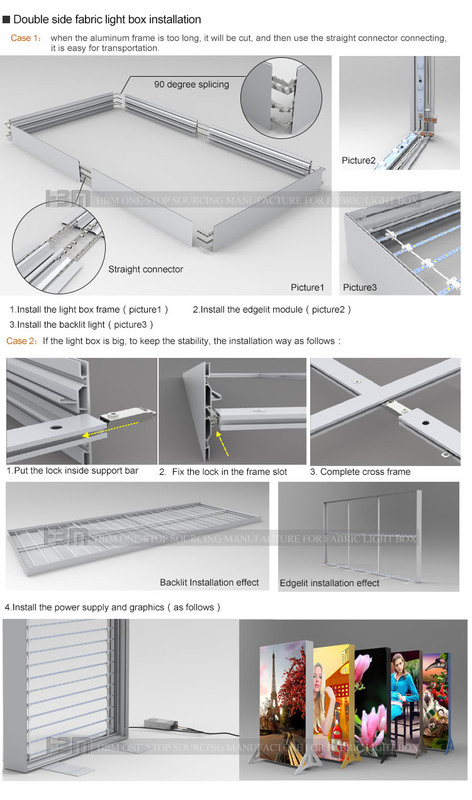 lit led is the best choice with it's high brightness and energy-saving, without shadow on the surface. Free Sample Sample is available,but you will be responsible for the shipping charge. 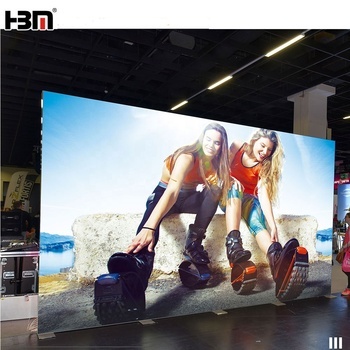 For double sided light box, it can be used backlit LED and edge-lit LED light. Guangzhou Huibaimei information Technology Co.,Ltd is a leading manufacture, located in Panyu District, Guangzhou city. 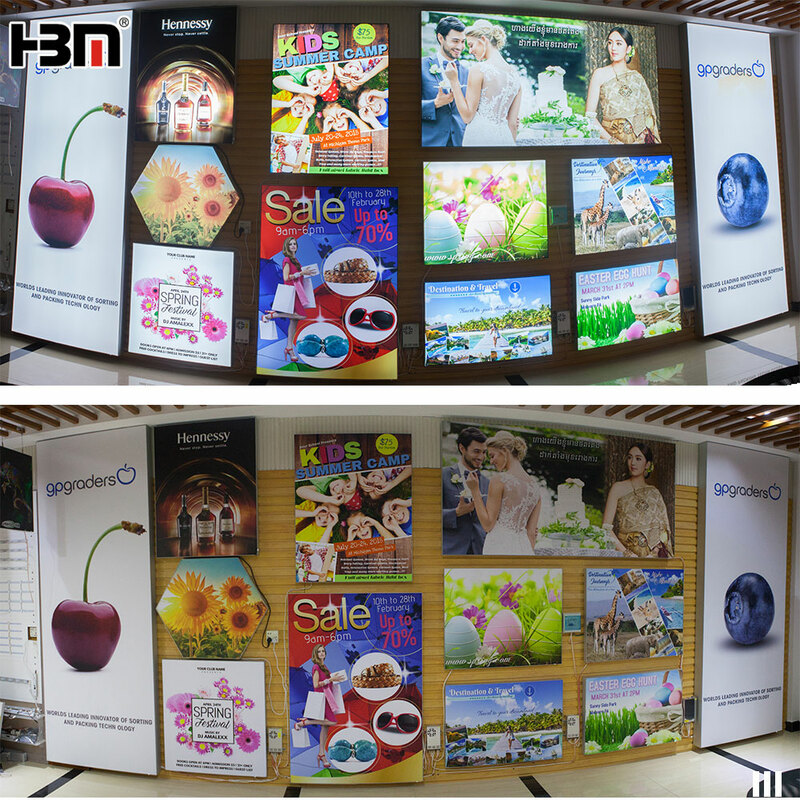 We are specialized in design, production and sale various advertising light box and advertising display products. 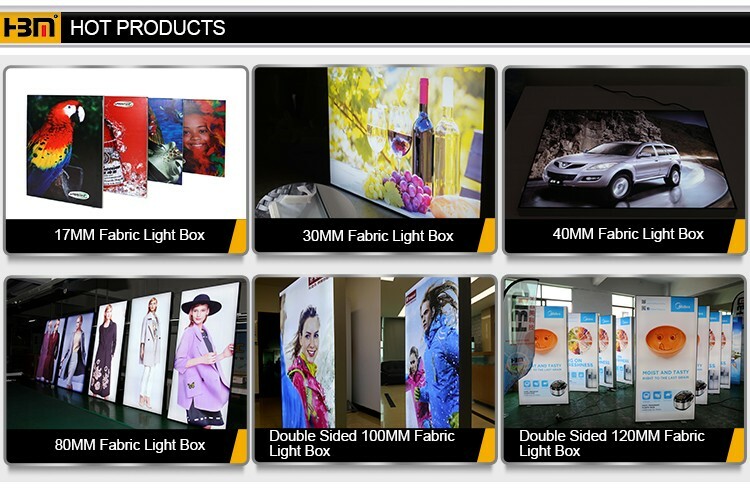 Our company strives to make better high quality led light box and advertising player, create our own brand HBM in Mar. 2009. With advanced facilities and professional management team, we are able to provide superior products according to the customers requirement. 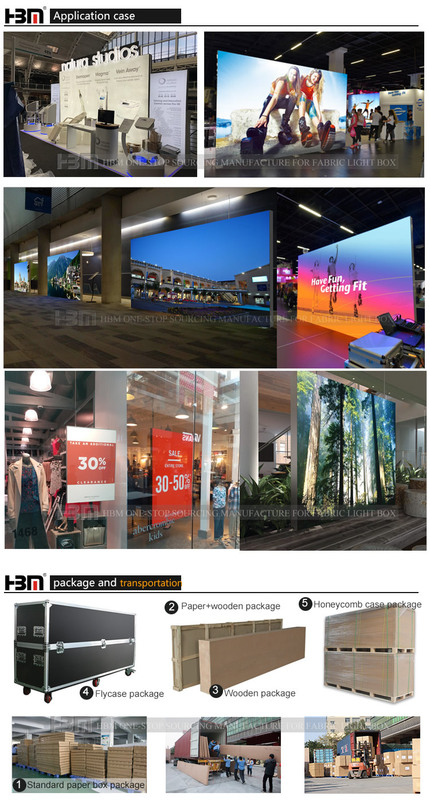 Recently we have developed fabric light box, fabric aluminum profile and LED, with years experience in manufacture advertising display products, the features of our light box is energy-saving and environmental protection, following the fashion trend. 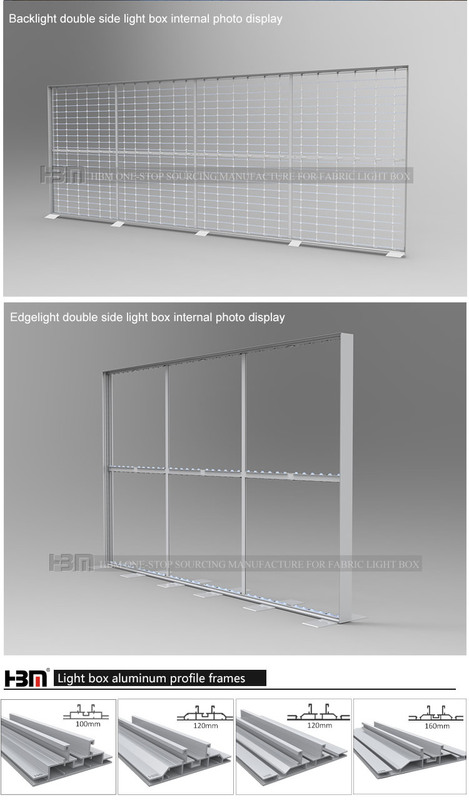 Our brand HBM is the first choice of the community, hospital, commercial buildings, large supermarket and other public places. 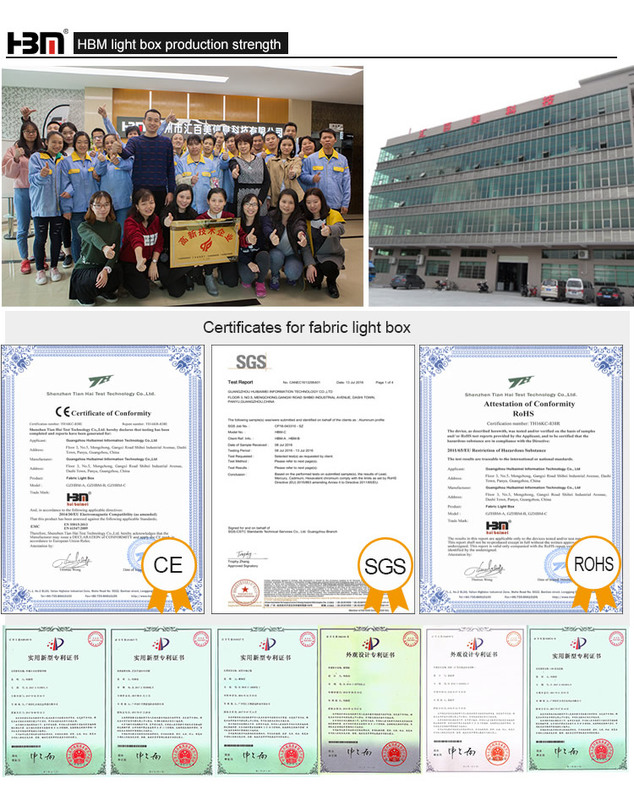 Our company will continuously strengthen internal managemant to improve staff quality and talent strategy to achieve the goal which our brand goes to the world. Q1: Can you customize the aluminum profile? A1: Sure, just please tell us your thoughts and send us your design drawing, we can develop the mold for you. Q2: Can you customize the aluminum profile’s color? A2: Sure, any colors available if only your quantity is more than 20 strips. 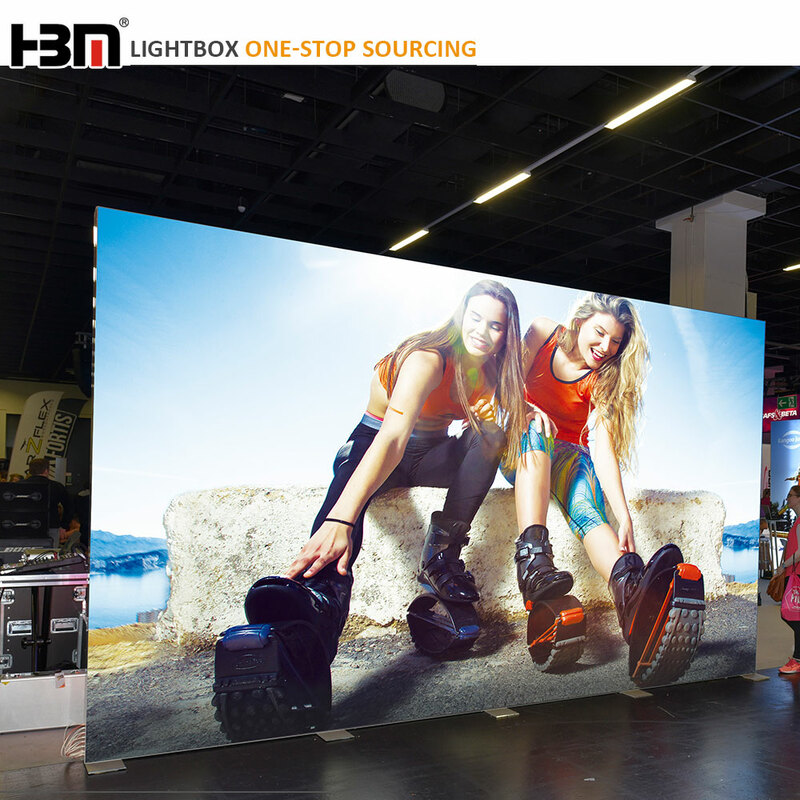 Q3: Any size available for fabric light box? A3: Yes, no limit to the size. Q4: How long is the lead time? A4: Sample usually takes about 1-2 working days, mass production depends on the quantity. A5: 1 piece is available. Q6: What's your payment term? A6: We accept Western Union, T/T, L/C and Paypal. Sample: full payment. Order: 40% deposit in advance before production. Q7: What's your shipping method? A7: Generally, we provide express shipping service like DHL/FedEx/UPS/TNT, sea transportation. and air transport . Length than 3meters, by sea is better way. Pls contact me as below if you are interest, many thanks. Guangzhou Huibaimei Information Technology Co., Ltd.